This image belongs to the travel and nature stock photo library. This stock photo of Radio Antenna Dish is available for licensing for commercial and editorial uses including websites, blogs, books, magazines, brochures and advertising. Restrictions may apply for images which contain third party copyrighted material or sensitive subjects. Photos of artwork are for editorial use only. All my stock images come as high resolution print files, supplied in Adobe RGB colour space @ 250dpi. Should you need other specifications please contact my to discuss. Credit Card payments can be made through the PayPal system on the website. Ilya Genkin Photography is a verified PayPal Business member and Paypal provides you with 100% security. Through PayPal, you can pay with any major credit card or debit card or your PayPal account. The payment is done securely and in realtime. I also offer Direct Bank Deposit for Australian customers. Please use xe.com website to convert prices to your local currency. All Printing is done in Australia by a professional photographic print lab. After printing, your photographic print is personally inspected by myself to guarantee your chosen print is beautifully prepared and presented. After close inspection I hand sign every print. It's then covered, rolled and packed into a hard cylinder tube to guarantee safe delivery. All shipping costs within Australia are included in the price of the print. Shipping within Australia is sent via Express Post Registered Mail with full insurance. All international postage is handled via FedEx with tracking information and full insurance. For International Orders your country may add an import tax at time of arrival in your country. You may need to enquiry about your specific country import taxes if they apply at all. At present prints are sent as print only so you may source the frame that suits your home or office locally. All canvas prints can be stretched around a 30mm (1.2") frame at any good quality local framer. Please allow up to 14 working days for delivery of your chosen print and 21 days for canvas prints. Any of the photos in my extensive collection can be made into black and white works of art. Please check the black and white landscape photography page how to get black and white prints from me. All prints come with a 100% satisfaction guarantee. If for any reason you are not completely happy with your print, I will provide a full refund for any print returned in new condition within one month of the purchase date, except for prints with custom cropping or non-standard aspect ratio. I carefully pack and ship the prints, but if it were to be damaged during transit, I will replace the print free of charge. Prints have to be returned before I send replacements. Sorry, no exceptions. International customers (USA, Canada, UK, Europe, Asia and other non-Australian customers), please note that refund does not include international shipping fee. Only the print price will be refunded. Please Note: Whilst the utmost care has been taken to accurately represent the color and contrast in my online gallery, due to web limitations with jpeg web images and the differences in individual user's monitor settings, printed colors may differ slightly from the photographs viewed on this website thus your final printed photograph will be vasty superior in color, sharpness tone and quality. For more information on fine art prints, prices, payments, shipping and handling please see Fine Art Prints page. 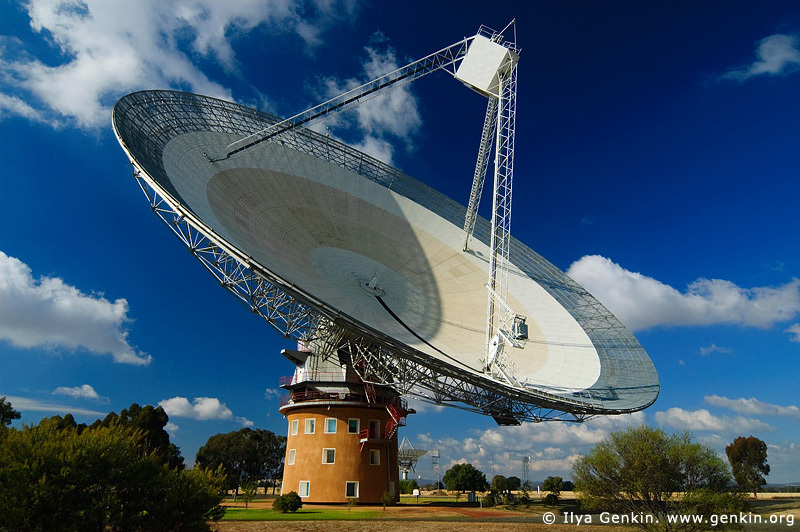 This image id AU-PARKES-0002 of Radio Antenna Dish, is copyrighted © by Ilya Genkin. This is not a public domain image. Copyright © 1990- Ilya Genkin. All Rights Reserved.